SHR Southland Jagoda Jag Leroy WC — Jag was a 115 lbs yellow (chocolate factored) English male. He was a well bred hunting retriever. Jag loved to retrieve and was an excellent water fowl dog. Jag’s sire was GMHR Southland Leroy Brown. His grandsire was the renowned FC-AFC-MHR Westwind Bold mannered, very good with children and had a charismatic personality. Jag was our all time favorite lab. Unfortunately, Jag has passed, but we have vials of his stored. 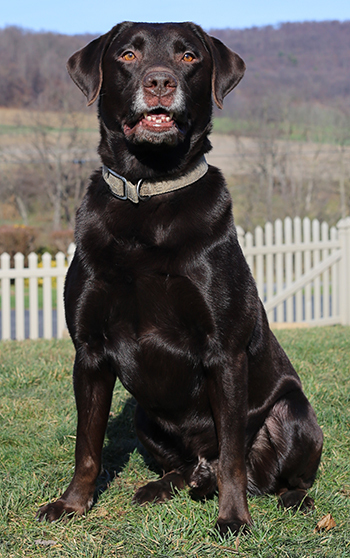 SHR Southland Sarge of Larke MH — Sarge is a 6-year-old chocolate American Field male who weighs about 80 lbs. He has the sweetest personality (much like his sire, Leroy and his brother, Jag). Sarge has grown into quite a handsome, muscular young male. Sarge’s sire is GMHR Southland Leroy Brown. His grandsire is the renowned FC-AFC-MHR Westwind Bold Tiger. Like his brothers, he loves to retrieve and is really good with children. Sarge earned his AKC JH title on June 10, 2007 after 4 consecutive passes. He earned his WC on 7-21-07 at the Great Pittsburgh Labrador Retriever Club. Sarge received his HRC SHR title on May 18, 2008. Sarge received his AKC MH title on 4-1-12! He sired 4 beautiful litters and with much disappointment he has been retired. Sarge received his AKC SH title with Doug Reiter on December 5, 2010. Many thanks to Doug! 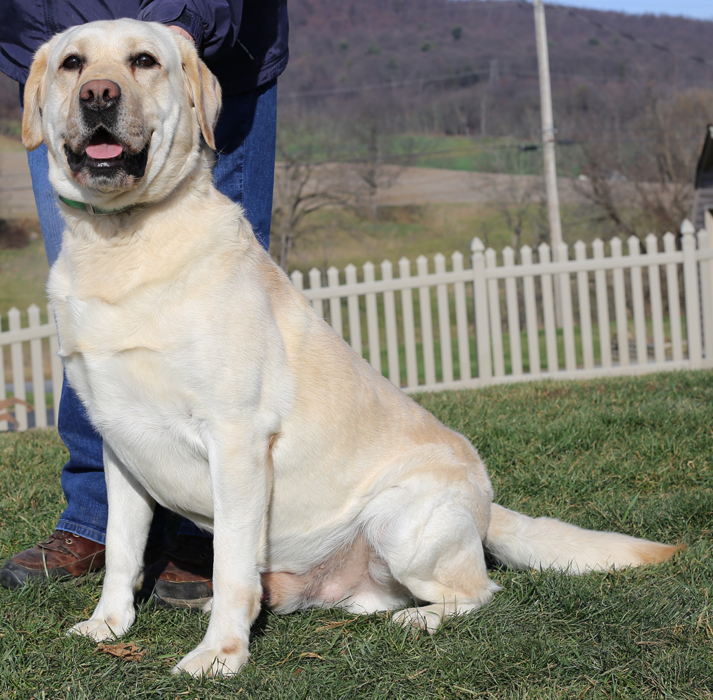 Sarge continued his training with Sean Hager of Muddybay Retrievers and earned his AKC MH title on April 1, 2012. Congrats to Sean and Sarge. Sarge qualified for the Master Nationals 2012. 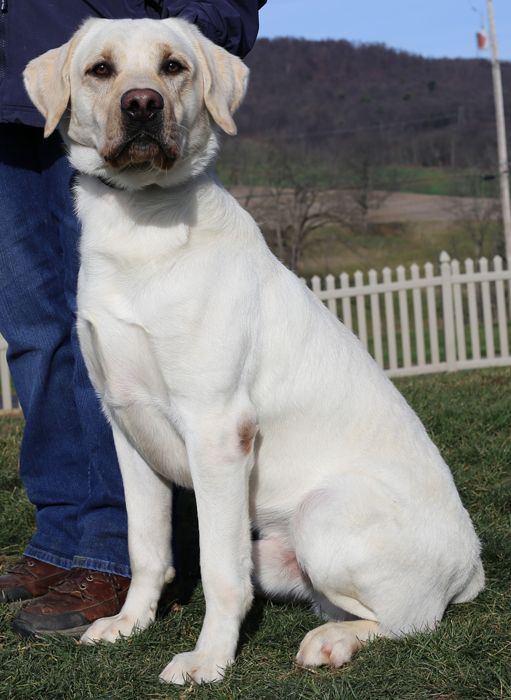 Larke Gentleman Jake SH — Larke Kennels is proud to have a Sarge and Ellie son standing at stud at our kennel. 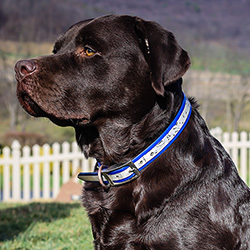 Jake was owned by our good friends, Polly and Brad Shaffer of Leesburg, VA. They have so graciously given Jake back to us so he can continue our lines. Jake is a 5 year old chocolate American Field male and weighs about 72 lbs. He has the sweetest personality. Jake is a strikingly handsome male with a deep rich chocolate coat. Jake’s sire is our own Southland Sarge of Larke MH and grandsire is GMHR Southland Leroy Brown. His great-grandfather is the renowned FC-AFC-MHR Westwind Bold Tiger. His dam is our own SHR Larke Miss Ellie Girl JH WC. His maternal grandmother has her AKC MH title and her maternal grandfather has his AKC SH title. He loves to retrieve and likes children. Jake has his AKC SH title. SHR Southland Sir Jackson of Larke JH — Jackson is a 98 lb. yellow American Field male. His sire was SHR Southland Jagoda Jag Leroy WC, who was my all time favorite Lab. 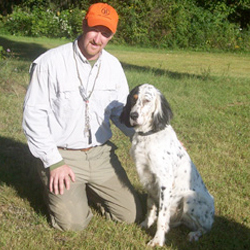 His dam is Larke Starlite Sky, who is our best upland bird dog. He was born on 9-18-07. Jackson was the only yellow from this litter of 5. He has some BIG paws to fill and he is doing so quite admirably. Jackson loves to snuggle and to be hugged like his sire, Jag. He has a real laid back personality. He is probably the “best” puppy that we’ve ever raised thus far. We receive a lot of compliments on his demeanor. His maternal grandsire was GMHR Southland Leroy Brown and great-grand sire was FC-AFC-MHR Westwind Bold Tiger. His maternal grandsire was the well- known “Pete” CH Franklins Pickpocket for Kerrybrook MH. He is one of 41 Labs to be dual titled. His maternal dam has her AKC MH title. 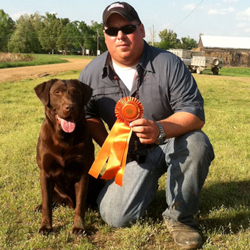 Jackson received his HRC SHR title at the Keystone Waterfowlers on June 7, 2009. Jackson received his AKC JH title in South Carolina on 11-21-09. 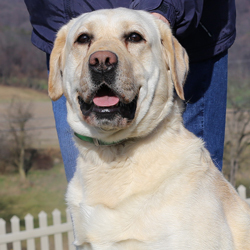 Deep Run Polo JH — Polo is a 2-year-old yellow English male with his AKC JH title. He has a nice show pedigree. His sire is AM/CAN/UKC CH Caer Bren Rugby. His mother has her AKC JH title. There are numerous show and field titled dogs in his pedigree. He has an awesome personality. He adapted well to us and is such a love bug. His striking good looks should produce some really nice puppies for us. Polo is available for stud! 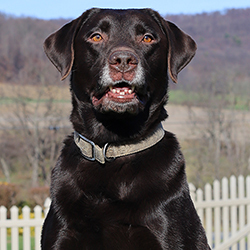 Larke Highcaliber Boomer JH — Boomer is an all English chocolate weighing about 75 lbs. He was born here at Larke Lab Kennels to our Meg. His sire is GCH CH Highcaliber Labradale Expresso. Boomer has his AKC JH title and went 4 for 4. Boomer has a super happy personality much like his mother, Meg. He is awesome with other dogs and likes kids. Boomer is available for stud. Larke Threepeat Sir Jagger — More information coming soon! 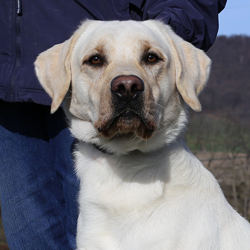 VC Iron Point’s Major of Larke MH — Major is an extremely talented, intelligent dog. 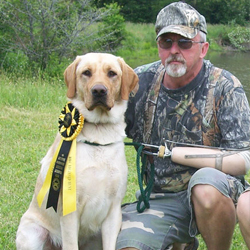 His first exposure to hunt test competition came in 2006 when he was awarded a Natural Ability Prize 1 within the North American Versatile Hunting Dog Association (NAVHDA) testing system, scoring a maximum score of 112 points. The NAVHDA Natural Ability test measure a young dogs ability to find and point birds, retrieve from the water, and track wounded game. 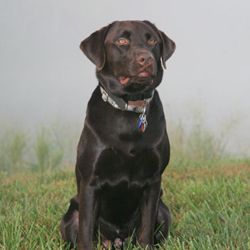 Major continued his training and matured into an exceptional bird dog. 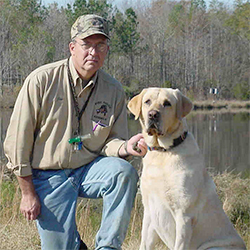 In 2010 and 2011 major competed in the American Kennel Club (AKC) Master Hunt Test competition and passed 6 out of 7 test to earn his Master Hunter (MH) title. The Master Hunter Title is reserved for exception dogs that demonstrate at the highest level the ability to find birds, point/retrieve and be steady to wing, shot, and fall. Next Major competed in NAVHDA at the Utility Level. The Utility Test measures a finished bird dogs ability to hunt in the field and find and point game as well as retrieve on land and water. The dogs need to be steady to wing, shot, and fall. They are required to perform a duck search in a swamp, and track and retrieve a duck at over 100 meters. They also need to show obedience and remain by a duck blind while the handler walks out of sight and shots are fired. Lastly they have to heel through heeling stakes on their way to a duck blind. In November of 2010, Major earned a Utility Prize 1 scoring a maximum score of 204 points. By earning a Utility Prize 1, Major was qualified to run at the NAVHDA Invitational to compete for the coveted title of Versatile Champion (VC). The NAVHDA Invitational is reported to be the toughest test in the gun dog world and is reserved for only the top performers in NAVHDA (Only Prize 1 Utility Dogs are eligible). The dogs must run in the field with a brace mate for an hour and demonstrate strong search, pointing, backing, and be steady to wing, shot and fall. They must execute a 100 yard blind retrieve across water, and honor another dog during a duck retrieve. Lastly, they must perform a double mark retrieve of two duck on the water in the reverse order in which they are thrown with a diversion shot. And, during judgment, they are off lead and must be heeled to each venue off lead. It is truly a tough test and only about 50% of the eligible dogs earn VC titles. On September 15, 2011, Major and his trainer/handler Curt Fry of Slamming Point Kennel, arrived in Bloomingdale, OH to run in the NAVHDA Invitational. The weather was poor at best with high winds and steady rain. In the end, Major and Curt executed each phase of the Invitational Test to the highest degree of competency and scored a maximum score of 200 points and earned Major’s Versatile Champion Title (VC).